The first time I ever had balsamic strawberries was 10 years ago in culinary school. We were learning about macerating berries that day, and our stainless steel tables were sprawled with bowls upon bowls of berries. The balsamic variation was my favorite out of the dozens; I was instantly gravitated towards their sweet and savory profile, complete with a trickle of freshly-cracked pepper and fresh herbs. That summer, I made balsamic strawberries like mad, using them in anything I could or simply eating them as-is for dessert or a snack. Sometimes adding fresh mint, other times adding basil. Sometimes adding floral honey. Sometimes topping them with a vanilla bean-infused mascarpone cream, which may be the closest thing to heaven when it comes to a simple, lovely dessert. Yes, I know, strawberries are not in season. I can hear most of my old chefs yelling at me now. 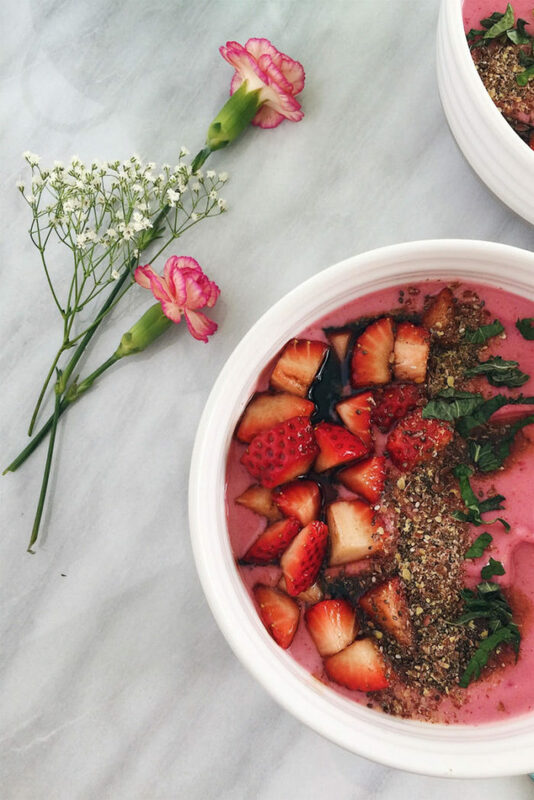 But I wanted to make a smoothie bowl to honor the fast-approaching Valentine’s Day and Heart Health Month, both next month. Plus, now you can get organic frozen strawberries pretty much everywhere, and it never hurts to bring a bit of spring into this dreary, cold, snow-smothered winter. 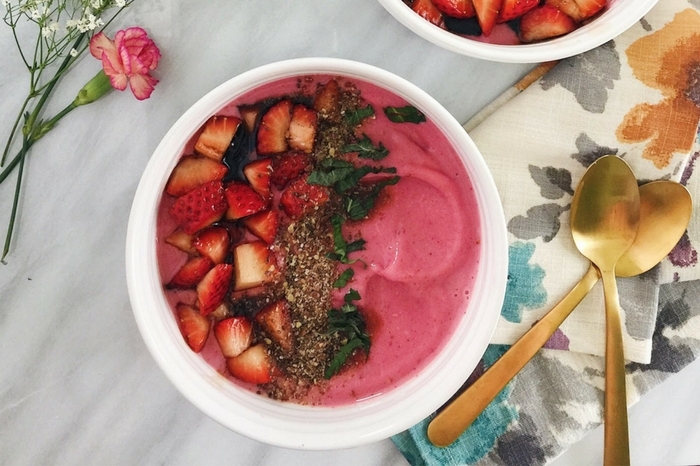 This delicious vegan strawberry balsamic smoothie bowl and its cheery pop of pink certainly brightened my day. And sometimes, you just need that. 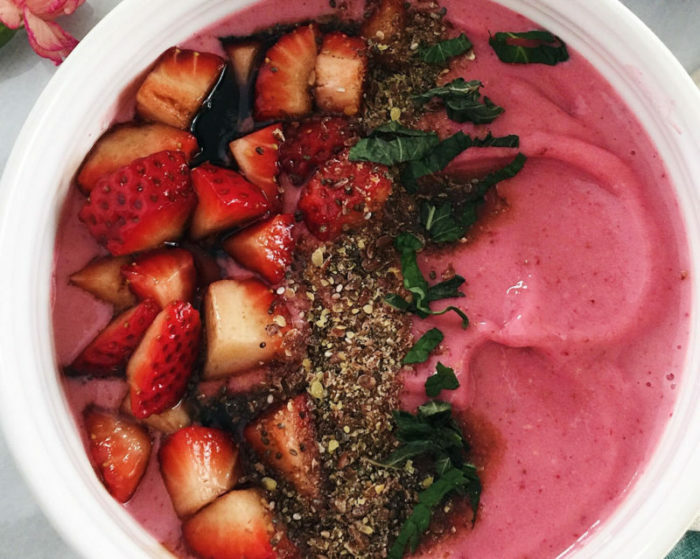 Actually, this smoothie bowl is completely healthy. 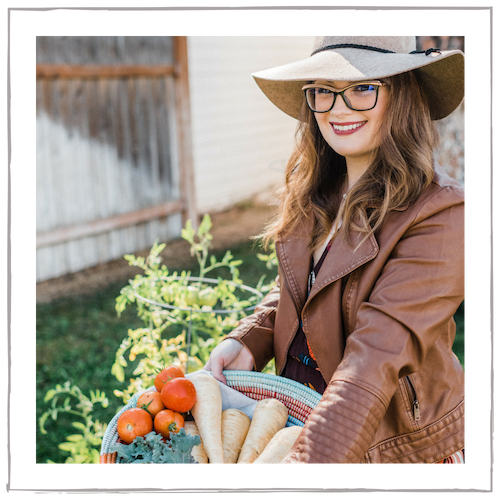 It’s a wonderful way to incorporate more plant-based products into your healthy lifestyle. And the start of a New Year is the perfect opportunity to do so. 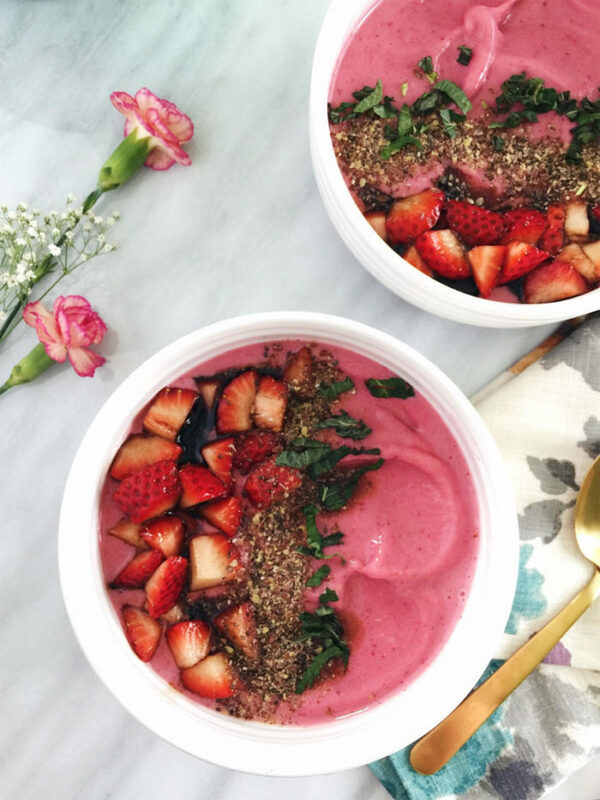 To finish these bowls off, I like to add a healthy dose of maple syrup-sweetened balsamic strawberries, fresh mint, flax seed, and chia seeds. 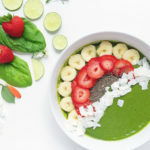 This smoothie bowl is full of vitamins and nutrients and it satisfies more than half of your daily fiber requirements! Thank you to Silk for sponsoring this post! 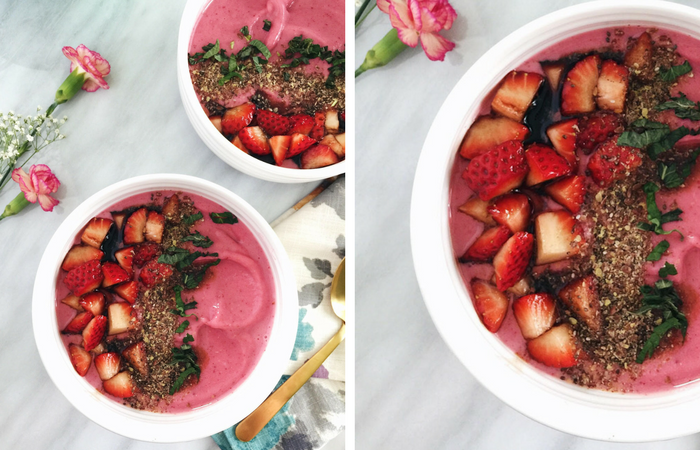 I hope that you enjoy this vegan Strawberry Balsamic Smoothie Bowl. 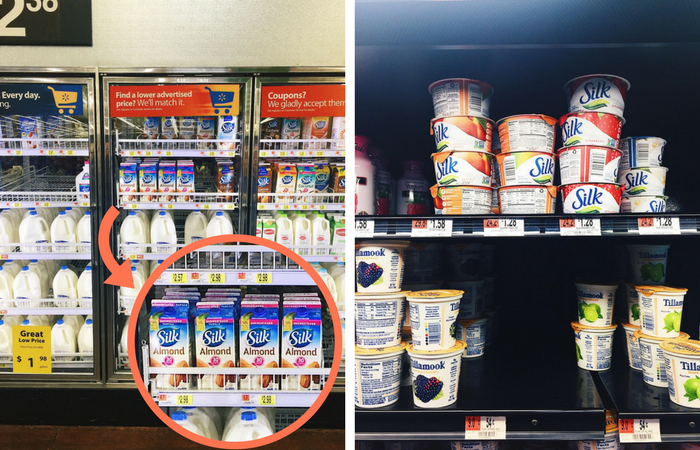 Be on the lookout for Silk’s new packaging coming out late this month, and pick up your Silk dairy-free yogurt and almond milk from your local Walmart! 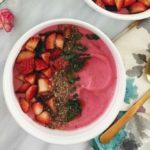 This Strawberry Balsamic Smoothie Bowl is creamy, delicious, and packed with vitamins, plant protein, and fiber. A touch of balsamic vinegar adds a unique flavor to this healthy, fruit-filled breakfast. Combine the strawberries, maple syrup, freshly cracked pepper, and balsamic vinegar. Refrigerate for 30 minutes. 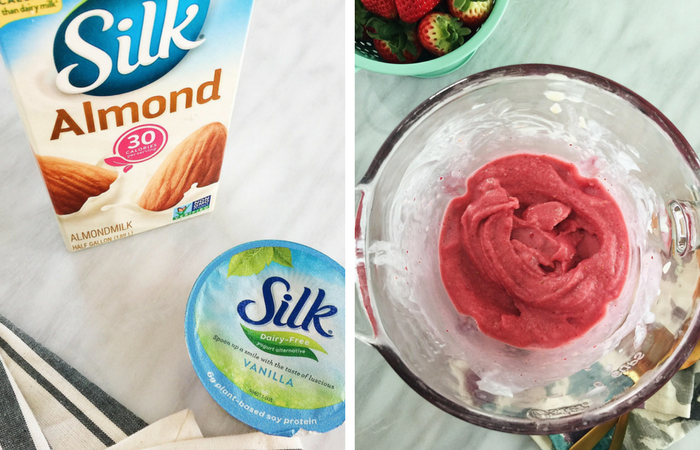 Blend the strawberries, banana, yogurt, and almond milk in a high-speed blender until smooth and creamy. 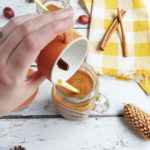 Divide the smoothie between two bowls. 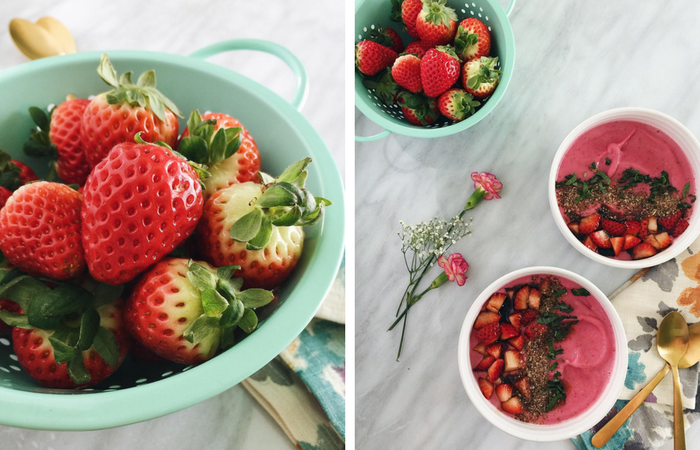 Top each bowl with 1 tablespoon each of ground flax and chia seeds. Chiffonade some fresh mint and gently stir into the balsamic strawberries. Divide the strawberries between each bowl and drizzle with some of the balsamic-maple syrup. 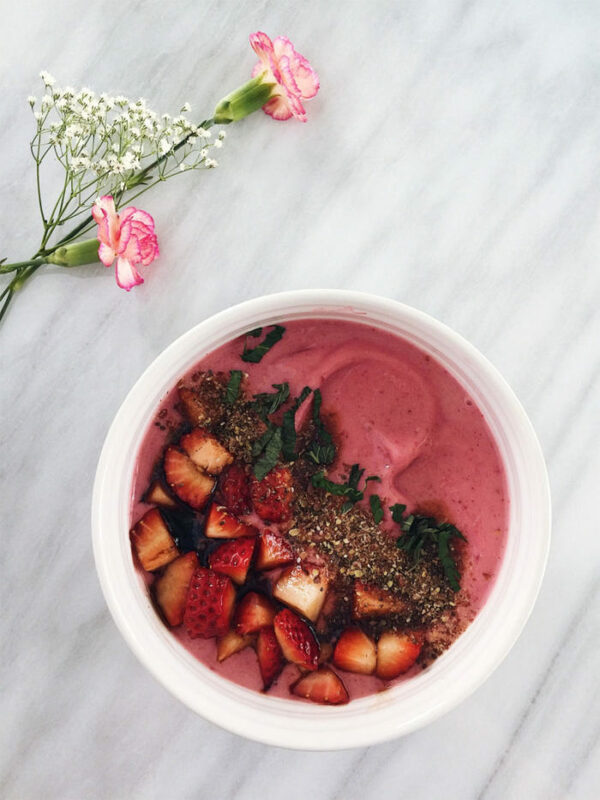 Garnish the smoothie bowl with additional fresh mint. Enjoy! Pinned again, lol!! 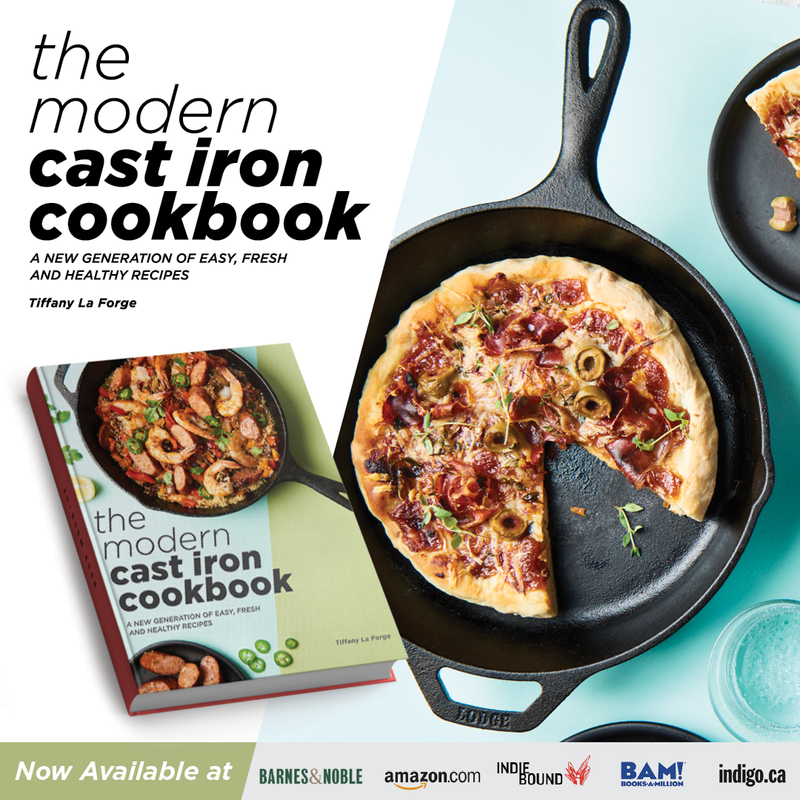 I can’t wait to try this, the flavors sound soo good! 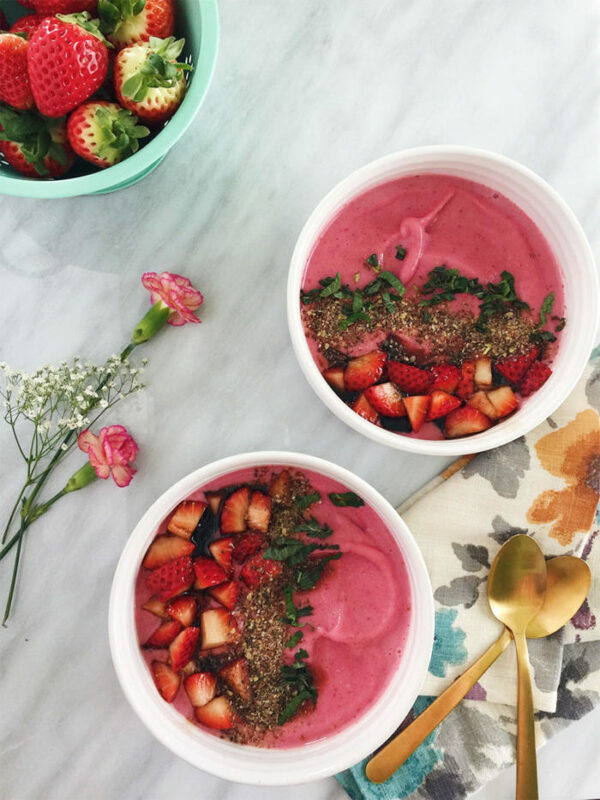 Haven’t tried a smoothie bowl, but this makes me want to give it a try! I love the combination you’ve put together. 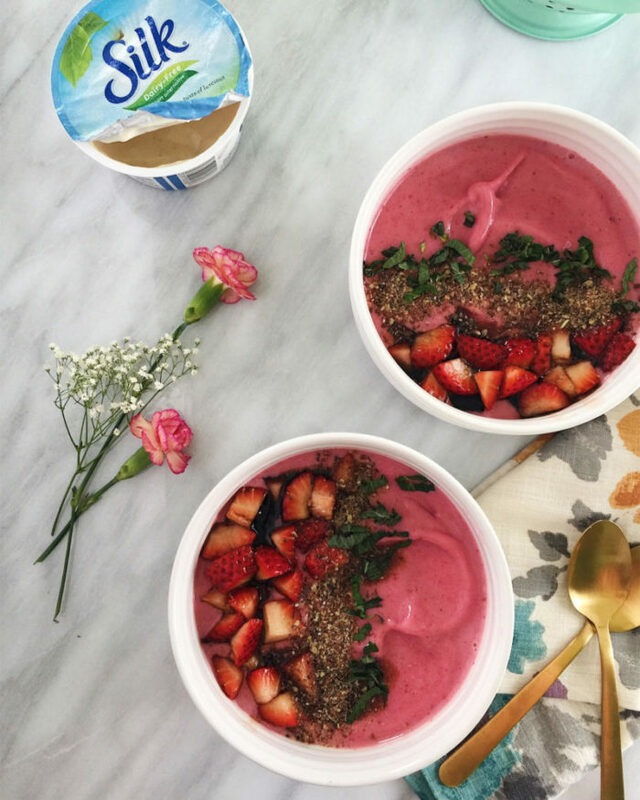 This smoothie bowl would make a great breakfast or snack. It really does, it’s such a lovely and balanced combination. 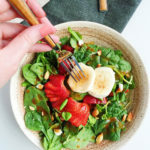 Pairing fruit with balsamic is always so good and a perfect way to WOW the taste buds! This is heaven! I was just thinking about my new workout plan and eating healthier. 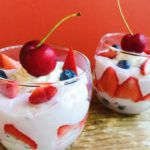 This is my new go to dessert! 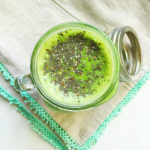 Such a delicious and healthy treat to reward yourself with after a good workout. I know what I’m having for breakfast tomorrow. I just picked up the strawberries. 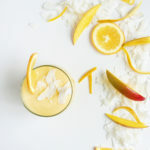 This was so refreshing and the flavor profile is really delicious!! This is top shelf!